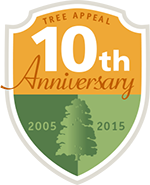 2015 marks the 10th anniversary of Tree Appeal. A lot has happened in ten years so we thought we would give you a run down of how we started and how we got to where we are now. 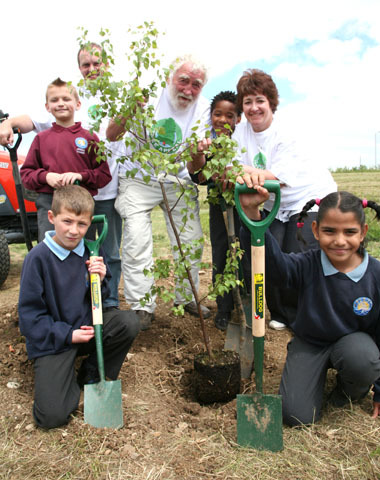 We have planted over 300,000 trees in the UK and Ireland. More than 600 schools have received saplings from us plus lots of woodland projects for the likes of the Wildlife Trust and the Trust for Conservation Volunteers. We treat every application on its merits and we have helped with a huge variety of projects over the years. They all have one thing in common though - the recipients never pay a penny for our trees. All Tree Appeal saplings are fully sponsored by our corporate partners and individual sponsors so we think that the most important message we have to say on our birthday is thank you; Thank you to everyone who has ever helped us to plant a tree! 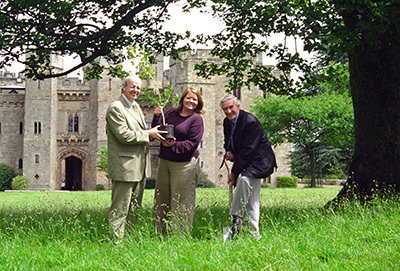 Lord Foster of Bishop Auckland helps to plant the first Tree Appeal tree at Raby Castle, County Durham. Tree Appeal began as an incentive scheme for our print business. Because we had experience with environmental projects, particularly in the agricultural sector, we decided it would be a nice idea to plant a tree for each of our customers. Unable to find someone to do it for us we decided to do it ourselves and began a journey which has seen over 300,000 trees planted and more than 600 schools benefit from the experience. 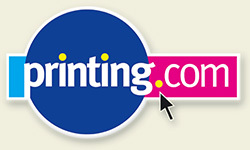 At the time we were operating a franchise of the nationwide print company printing.com. They liked our 'Tree Appeal' so much they asked if they could run the scheme through all their outlets - more than 300 stores across the UK. Almost from the start we began to see that many of our customers were more interested in the potentials of tree planting than the print itself and so Tree Appeal was born, almost by accident. One notable company that joined us right at the beginning was Cummins Engines. They were looking for a way to celebrate the 40th anniversary of their Darlington factory which we responded to by planting 40 trees in local parks. The trees were planted by the families of employees who had worked there for 40 years with help from our good friend Professor David Bellamy. In 2006 we linked up with Sainsbury's to help promote the White & Wild milk brand. 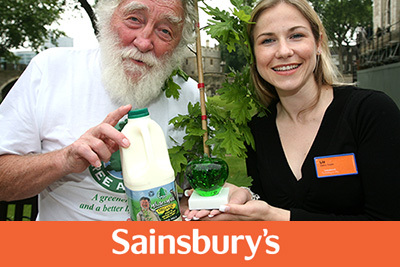 Every 50 litres of the milk bought by Sainsbury's customers sponsored the planting of a tree. 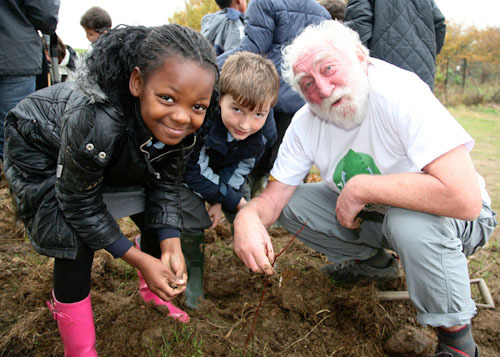 Sainsbury's went on to plant more than 50,000 trees with Tree Appeal and became one of our biggest sponsors. 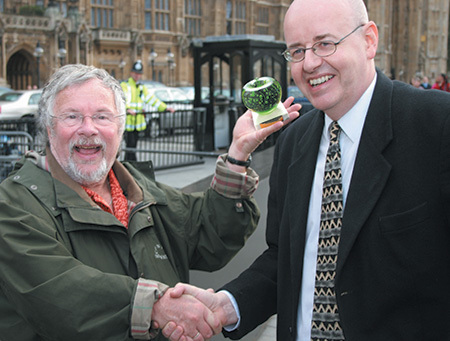 Bill Oddie and Bob Swinbank at the Houses of Parliament with our first Green Apple Award. 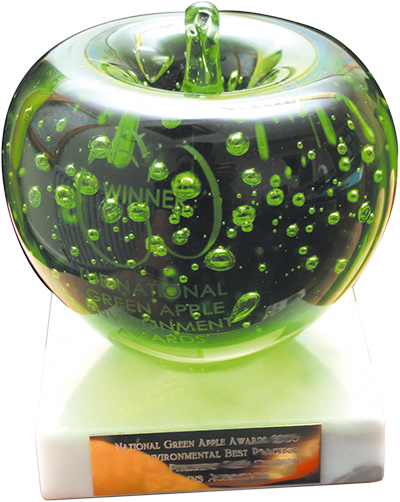 In November of that year we received a Green Apple Award which was to be the first of many won by Tree Appeal over the coming years. The presentation was at the Houses of Parliament where the award was received on our behalf by Bill Oddie. We became a signatory to the United Nations' 'Plant for the Planet' billion tree campaign. All Tree Appeal trees are now registered with the UN and contribute to the grand total. At the start of 2007 we signed an exclusivity agreement with printing.com so that they became our only partner in the online print sector. It was an arrangement which has seen printing.com plant 90,000 trees over the following years. In the summer we launched our Tree Twinning initiative - the planting of a tree in the UK 'twinned' with another in a developing country - with a special project in Ghana. 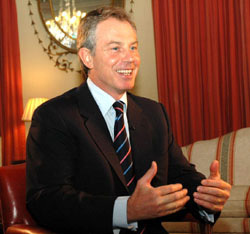 2007 marked the 200th anniversary of the abolition of the trans-Atlantic slave trade and also the 50th anniversary of Ghana's independence. We provided a wooden play system for the town of Anomabo and initiated a number of tree planting schemes in the area. 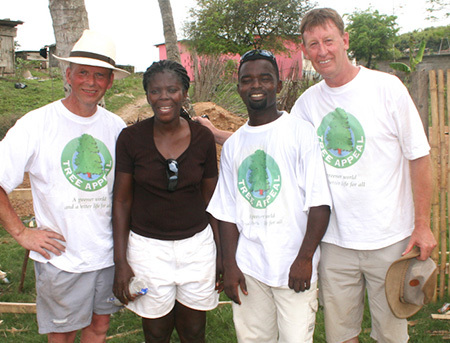 We made many good friends in Ghana who remain part of the Tree Appeal family to this day. One of our new partners in 2007 was Principality the largest building society in Wales, who were keen to promote their ground-breaking sustainability programmes. 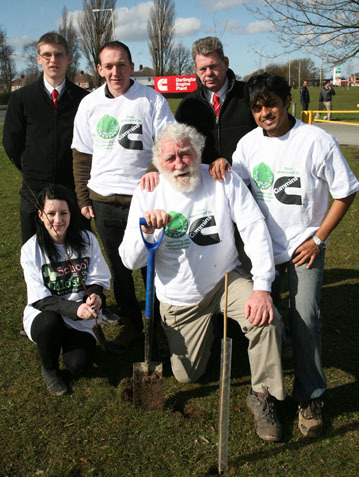 Principality planted 3500 trees in 30 Welsh schools, many of which were visited by Professor Bellamy and Dylan the Dragon! We started getting some recognition in high places in 2008 including from the Prime Minister and from DEFRA which made us think we must be doing something right. A highpoint of the year was a visit to Bestival with Professor Bellamy who must have been photographed a thousand times with festival-goers. All in a good cause because each photograph sponsored the planting of a tree, match-funded by printing.com. International chain Holiday Inn came on board with a planting day in the grounds of their Washington hotel with children from local schools. 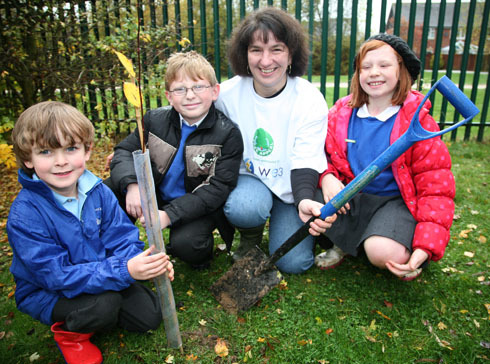 It was clear at this stage that our 'Trees for Schools' programme was going to become the major part of our activities. The dual focus on environmental and educational benefits has proved a winning combination for many of our sponsor companies. 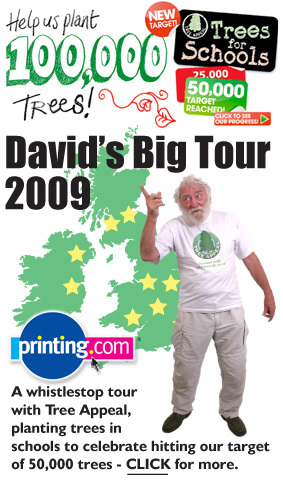 Printing.com reached the milestone of 50,000 trees in 2009 and to celebrate they asked us to organise a nationwide tour. Over the course of a week the Tree Appeal team, with Professor Bellamy in tow, visited 10 schools around the British Isles. The whistle-stop planting tour took in Edinburgh, Glasgow, Belfast, Dublin, Cardiff, Manchester, Birmingham, Leicester and London. All in all it was quite an endeavour. When Santander heard what we were doing they liked the idea so much they asked if we could do a tour for them. So we ended up repeating the exercise, with a different selection of schools the following week (after which we needed a lie down). We did one of our biggest Trees for Schools projects this year at West London Academy, a new build multi-school campus near Northolt. Over the course of several visits we planted more than 4500 trees in the extensive grounds. 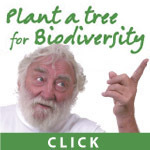 The United Nations declared 2010 to be the International Year of Biodiversity, to which Tree Appeal was happy to become a signatory and which has since developed into the Decade on Biodiversity. The focus on habitat creation and the importance of biodiversity are subjects we have always given priority to so the UN initiative was a perfect fit for Tree Appeal. This year we launched our tree tagging system so that whenever a school receives trees from us they also get a set of printed tags. 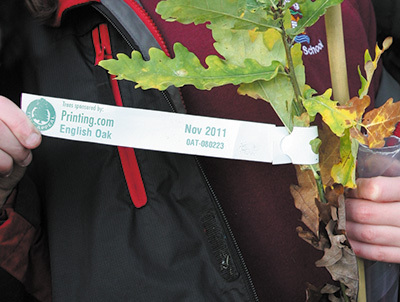 These tags display several pieces of information; the date the tree was planted, the species, the unique tree number as recorded in our database and, not least, the name of the company that has sponsored it. We ended the year with a Christmas theme. 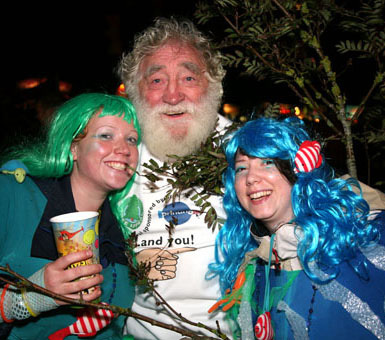 Professor Bellamy, in his secret disguise as 'Green Santa', visited a number of Brighton locations to hand out some surprise presents (Okay, they were trees). The festive goings-on were courtesy of Family Investments, Brighton-based ethical investment company. In the run up to the London Olympics, Santander wanted to do something special around themes of sustainability and legacy. The project involved two coachloads of Spanish athletes and several local schools all coming together to plant trees. The location was Mayesbrook Park in the Official Olympic Borough of Dagenham and Barking. It made for a busy day in a busy location. In contrast we planted at one of our remotest sites when we supplied trees to Muck Primary. 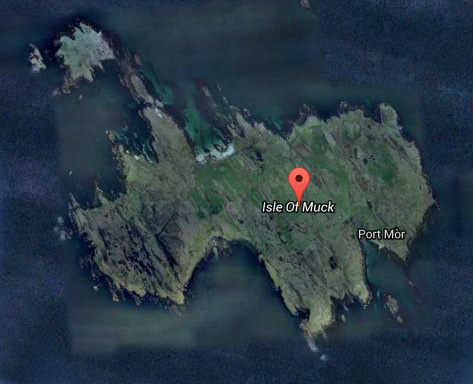 The Isle of Muck is in the Inner Hebrides with a population of about thirty. The school has only six pupils, all of whom wrote to us and sent us some lovely pictures they had made, so we were only too happy to send them the trees they requested. In 2012 we helped Version One undertake a series of interesting projects that combined tree planting with support for African schools. With the help of charity Computer Aid International refurbished computer systems were supplied to schools in Ghana and Kenya. In addition Version One have planted more than 4600 trees. We were very busy working with Pfizer this year including a number of Roadshow planting days at schools on the south coast. There was sad news this year with the spread of Ash Dieback Disease which threatens to destroy the majority of the UK's 80 million Ash trees. Defra issued a notice banning the movement of Ash, one of our most popular trees. The disease entered the country on imported saplings so it's worth noting that Tree Appeal has only ever used native broadleaf trees grown locally from hand collected seed. Tree planting became a big focus for our corporate partner Carbon Footprint in 2013. Carbon Footprint help hundreds of companies develop robust carbon and sustainability programmes and provide high quality carbon offsets. 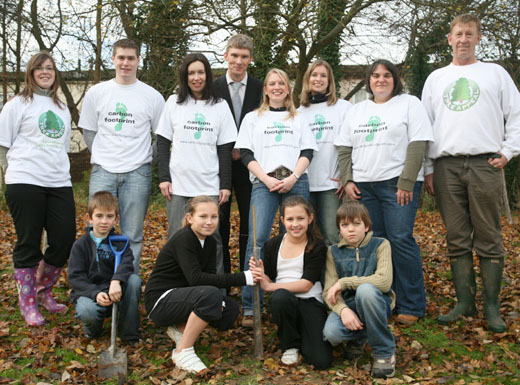 Tree Appeal carries out tree planting on their behalf and helps organise planting events for their clients. Carbon Footprint has planted more than 36,000 trees to date. 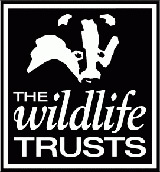 2013 also seemed to be a big year for our work with the Wildlife Trusts. Our corporate partners sponsored thousands of trees for woodland projects by Northumberland WT, London WT, Surrey WT and Berks, Bucks & Oxon WT - all in all, a busy time for 'the badger'. 2014 marked the fifth year of our work with Synergy Compliance and WE3 Compliance, part of a group of companies providing integrated environmental services. 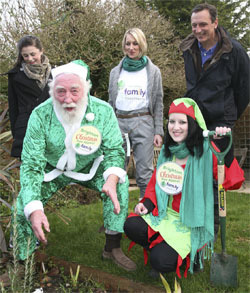 Tree Appeal has planted a tree every year for each company that is a member of their environmental compliance schemes. Another long-service partner deserving recognition is Kent Services who have been with us since 2007. Kent Services specialise in the design and manufacture of dedicated, museum quality, sustainable packaging systems for art objects travelling worldwide and they have Royal Warrants from both HM The Queen and HRH The Prince of Wales to show for it. Representatives of Cargill at the planting day at St Francis Xavier School, Richmond for the company's 150th anniversary in June 2015. At the time of writing we have just finished planting for the first part of the year and we finished the season with a planting day for our newest partner, Cargill. In 2015 Cargill, the international nutrition company, is celebrating 150 years in business. As part of the festivities Tree Appeal organised a planting day at a North Yorkshire school where the children planted 150 trees helped by Cargill employees. We are now gearing up for the start of the planting season in the Autumn and already have a heap of applications to process. There are sure to be some adventures so if you would like to join us you are very welcome. Let's see what the next ten years hold.